The Super Soaker XP 220 was the second-smallest air pressure water gun released by Larami Ltd. in 2000 under the Super Soaker XP brand and is like the Super Soaker XP 215s slightly older brother. While definitely a pistol-class water blaster, the XP 220 will fit only larger pockets. Having twice the water capacity of the XP 215, the XP 220 offers a little longer field life, though its limited output and capacity means this water blaster is not meant to challenge significantly larger pressurized water blasters. The Super Soaker XP 220 is mounted by plastic ties and is mostly visible within its original packaging. Unfortunately, back in those days, I paid much less attention to the packaging and only have a picture of the back side of its box. 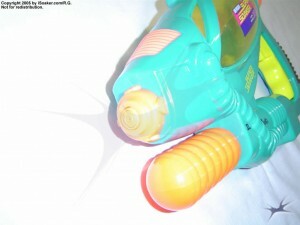 This picture of a Super Soaker XP 220 twin-pack shows how these blasters can be mounted. 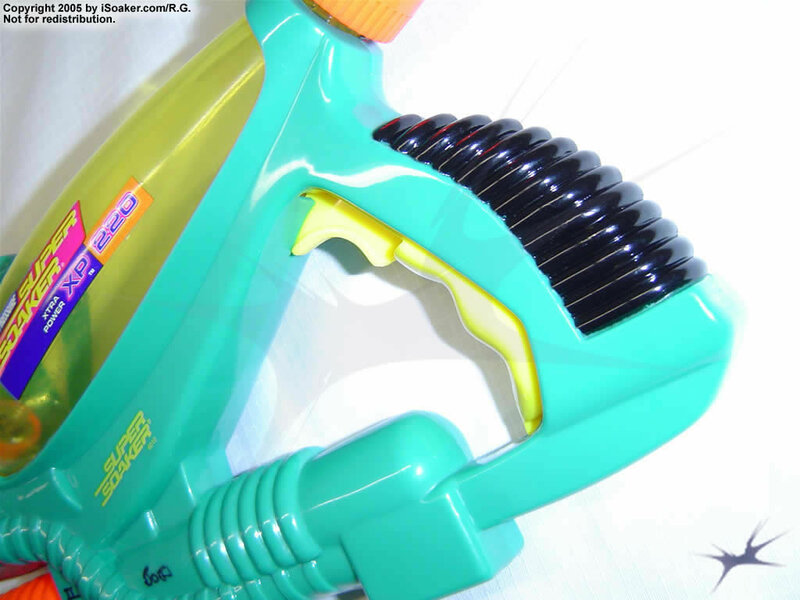 What should also be noted is that there are many colour variants of the Super Soaker XP 220 with 7 versions listed on iSoaker.com, though the total number of variations is likely more. As can be surmised from all the types released, the XP 220 sold well and is a popular water gun of choice for many people. Free from its packaging, the Super Soaker XP 220 can be seen in its full glory. 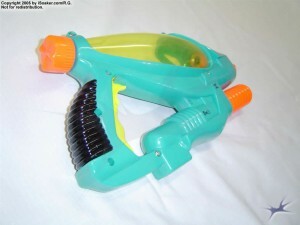 Being a pressurized-reservoir based water blaster, its nozzle, pump, reservoir cap, and trigger are all easily visible. The sloped design of the XP 220 naturally guides water in its reservoir towards the nozzle. As can be seen from this top-angle view, the nozzle’s intake valve only reaches to approximately the halfway mark on the reservoir. The intake tube actually resides in a slight depression in the reservoir, allowing its opening to remain submerged in water until the reservoir water level gets quite low. The majority of water in the XP 220’s reservoir can be used to blast one’s opponents with little waste. The reservoir, itself, is accessed by unscrewing the XP 220’s rear-mounted tethered reservoir cap. As with the XP 215, it is best to hold the cap slightly when filling to prevent the cap’s anchor from restricting the opening from accepting more water. Once filled, the cap must be fastened securely. 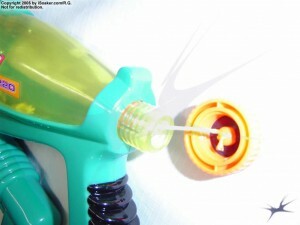 An inner rubber O-ring must be compressed to prevent any pressurized air and/or water from escaping out that opening, stored instead until the trigger is depressed to permit water to blast forth from the nozzle. The nice thing about this angled reservoir is that it naturally guides water towards the nozzle, being downward-sloping towards the front. However, even when angled upwards for increased range, there is enough angle down to keep the intake tube submerged. The advantage of this is that the intake tube to feed the nozzle is shorter, reducing the amount of drag from the tube’s opening to the nozzle, itself. One of the XP 220’s more interesting design features is its trigger and trigger-grip region. Unlike standard triggers which are depressed by one’s index finger, for the XP 220, the upper part of the trigger is actually close to its pivot point. Instead, the trigger is best depressed by squeezing on the lower part. For most adults, this likely means squeezing with one’s ring and middle fingers more. If one’s hand is small enough, one’s pinky finger may also be used. 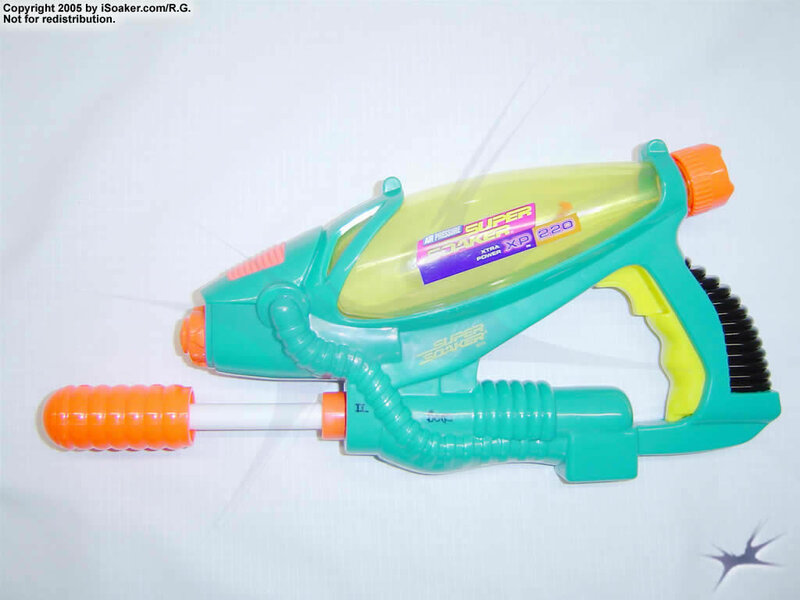 To prepare the XP 220 for blasting, beyond filling its reservoir 2/3 to 3/4 full of water, this water gun needs to be pressurized. Pressurizing the XP 220 is accomplished via its forward mounted pump. Rotating freely around the pump rod, the short stroke length of this pump still manages to build up operating pressure fairly quick (20-30 full pumps on average, but can be completed in less than 30 seconds when pumping quickly). Of course, to build pressure, one must also ensure the reservoir cap is fastened tightly; it is advisable to listen for any escaping air sounds after the first 10-or-so pumps and tighten the reservoir cap more if necessary. The goal here is to ensure a tight seal without over-tightening the cap which will shorten the lifetime of the inner O-ring seal. 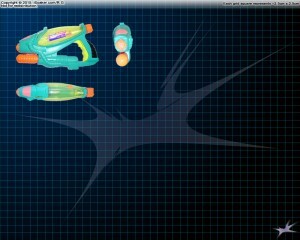 Of course, things all boil down to performance and the Super Soaker XP 220 does well for a water blaster of this size. Having similar range, but slightly more output than a Super Soaker XP 215, the XP 220 wins out on available shot time thanks to its larger reservoir. While not a truly drenching-capable water blaster, the XP 220 offers enough power for light skirmishes as well as assurance to keep opponents at a safer distance during larger water fights while one tries to refill one’s primary and/or seek a safety zone. Beyond this, the XP 220 pairs perfectly with the Super Soaker XP 310. 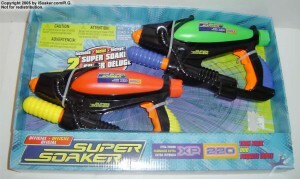 The XP 220 and XP 310 are one of the few pairs of Super Soakers released the same year that match so perfectly in colour scheme. With the XP 310 being the larger air-pressure blaster and the XP 220 being a great back-up choice, the pairing of these two water blasters comes quite naturally. 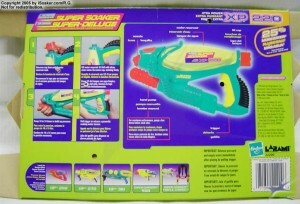 The Super Soaker XP 220 is a great, small-salibre water blaster. Similar in styling, but larger than the later-released XP 215, the XP 220 provides decent output for a water gun this size and has longer field life than its smaller, younger brother. It’s full-grip trigger takes a moment to get accustomed to, but its ease to fill and quickness to pressurize makes the XP 220 a great choice for light skirmishes and a solid performing back-up for larger battles. 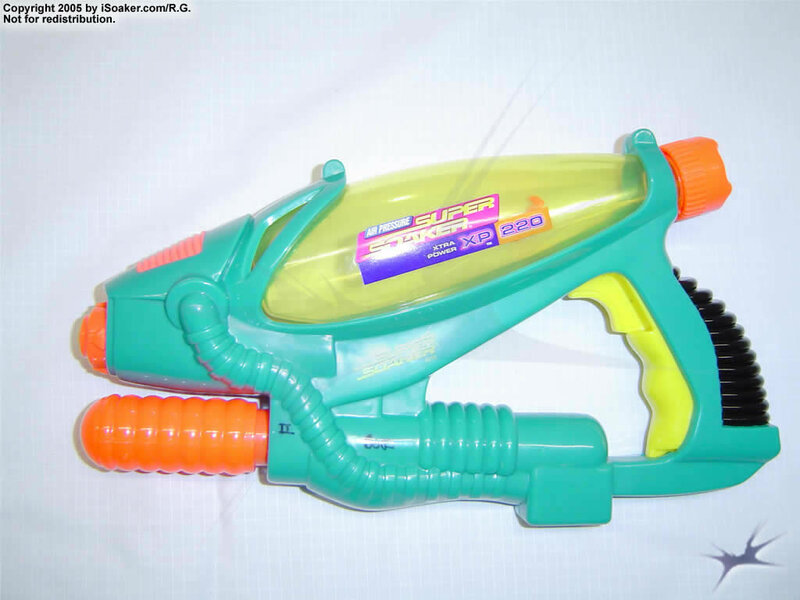 A great part of any armoury, the Super Soaker XP 220 outclasses most similarly-sized non-pressurized water blaster, but is, of course, out-blasted by larger pressurized blasters. I still keep my two XP 220s in my active armoury just-in-case an unexpected, emergency water fight begins. Soak on!